Well, this is it, the moment we've been working towards. We have a boat, our home in Minnesota is sold, Dawn quit her job, I transferred to Atlanta and am in a good position to drop my work schedule to a minimum this winter, and as of this morning we moved out of our temporary apartment in St. Paul. This was our intermediate step between 2500 sq. ft. house and 200 sq. ft. boat. In the last two weeks we've sold or given away our remaining furniture, stored some household goods we'll want whenever we return, donated all other household goods and many of our clothes, and ended up with eight or nine boxes to pack in the back of our Xterra to bring to the boat in South Carolina. I'm still flying a full schedule so I only had two days off to help Dawn pack all this up and clean the apartment. We unintentionally slept in a bit this morning so I didn't help with the final cleaning as much as I intended, it took a while to load up the last boxes headed for our storage unit, and I ended up at the airport a bit later than planned. No biggie, I made my commuter flight and got down to my new base airport of Atlanta in plenty of time. I'm in Austin tonight, West Palm Beach tomorrow, and Kansas City on Sunday night. After my trip is over on Monday I'll be flying to Indianapolis, where Dawn will meet me so we can drive the rest of the way to SC together. We're hoping to do a bit of the Kentucky Bourbon Trail along the way, and should arrive in Charleston on Nov 2nd. We're not actually moving onto Windbird right away. She's still on the hard, obviously, with the rig down and the chainplates being replaced, with some attendant cabinetry dust and general boatyard grime. Living without refrigeration, water or plumbing presents its own difficulties. But mostly it's the idea of hauling Piper up and down a 12 foot ladder that is dissuading us. Judy mentioned that she lived on the hard with a small pup once, hauling her up and down the ladder in a sack. We tested that idea out with Piper in Minnesota and...yeah, it didn't go well. So we found a dog-friendly VRBO in Isle of Palms for $490 a week, and will live there the first week at least. There really aren't that many things we need to get done before splashing Windbird, but I figure we should take full advantage of the time she's in the boatyard to get projects done that might be harder in the water - and being there every day will allow me to supervise the boatyard's work. Leigh Jones will be coming down from Myrtle Beach to help with the radome, masthead transducer, and thru-hull transducer installation, and I'll likely do the initial installation on the Garmin chartplotter. But once the boatyard work is done we'll be heading back up to Myrtle Beach so Leigh and Rico can replace the rest of the lightning-fried equipment, and Dawn and I can get the rest of the boat ready to head south to Florida and the Bahamas in January and February. 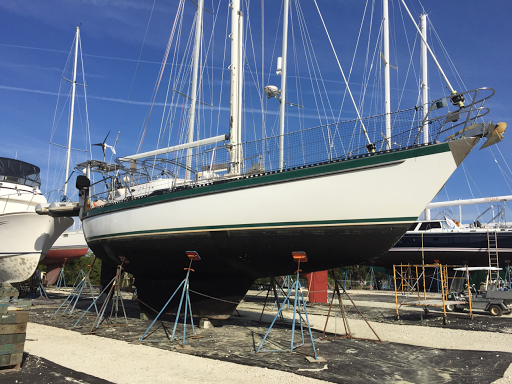 Windbird's refit has finally begun in Charleston, three weeks into the month in which I was hoping to complete it. Most of that is thanks to Hurricane Matthew, plus some shortcomings in my communication with the boatyard. As a matter of fact, due to our early arrival to the yard last month I neglected to insist on an estimate before the boat was already out of the water. It finally came in earlier this week, and was quite a bit more than expected - $20k to replace the standing rigging alone, plus another $3.5k to yank the mast and restep it. It's considerably more than we were budgeting, but it needs to be done, and frankly I put myself in no position to bargain. So onward we go, the refit of our old boat behind schedule and over budget. Shocking, right? I had a 5-day trip to Lagos from Saturday until Wednesday. I've been to Africa a number of times but never for work and never Nigeria. Due to the crime & security situation in Lagos, my airline "strongly recommends" not leaving our layover hotel compound. So I had 52 hours to be productive writing my monthly column for flying, researching boat stuff, ordering supplies.... HAH! No, I frittered it away eating and drinking with the crew, sitting by the pool while keeping one eye out for malarial mosquitos, and finishing one book ("Steaming to Bamboola") and starting another ("Seraffyn's Mediterranean Adventure"). Actually, I also did some thinking about our goals and priorities for this winter. We want to do a shakedown cruise - really, shaking down the boat but mostly gaining experience ourselves - that lasts several months. I don't think I've actually said this explicitly in previous posts, but we've modified our plan to include cruising Florida and the northern Bahamas this winter/spring, returning to cruise the U.S. east coast next summer, and then heading to the Caribbean in Nov 2017. This new plan (really our original plan) allows for some of the refit to be done next summer, but the most important things should be done this fall. If we try to do it all, we'll never even leave Myrtle Beach. To my mind, the three areas that are most important are: #1: Current & adequate safety equipment. #2. Sound mast, rigging, and sails. #3. Good navigation and self-steering equipment. 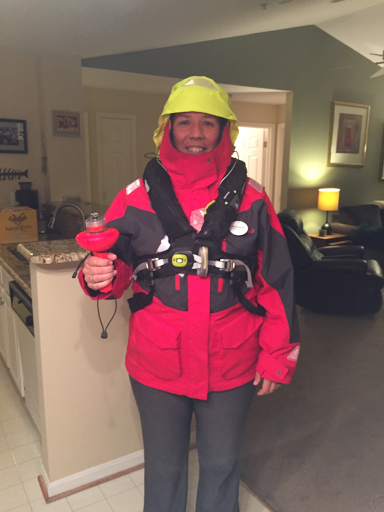 We've just began to address safety equipment by purchasing good offshore PFDs and tethers at Annapolis. We will be getting the liferaft repacked while in Charleston. I still need to go through the ditch kit, inventory its contents, and replace expired items. Ditto the medical kit, which is actually still up in Cape Cod with Judy. The mast, rigging and chainplates we're taking care of in Charleston at great expense, and hopefully will be done by ~ Nov 10th. We'll also be repacking stuffing boxes and repairing some water intrusion into the skeg while on the hard, and also refreshing bottom paint, but we'll not repair the small blisters that have started to pox Windbird's bottom at this time. We got quotes for a new mainsail from multiple lofts at Annapolis and ended up going with Doyle; we'll be getting our replacement main for considerably less than we thought ($3300 vs $4600). Windbird was previously adequately equipped for #3 but the lightning shot that all to hell, so installing the new chartplotter and autopilot will be priorities once we get back up to Myrtle Beach. One previous priority - replacing the dodger, bimini, enclosure, and stack pack - has been shoved aside. Like everything else, this has turned out to be more expensive than we anticipated, and it would've taken up additional time too. The reality is that the fabric is faded but still servicable; the expensive issenglass is just fine; it's just the stitching thread that is sun-rotted. So after I landed in Atlanta from Lagos on Wednesday, I flew to Charleston, grabbed all our canvas out of our V-berth, and drove it to Georgetown to be restitched. The boat would look sharper with new canvas, sure, but the current stuff should get us through a year just fine. Another thing I would like to improve but that can really wait until next year is our solar power array. I got some great ideas by talking to knowledgeable folks at Annapolis, and I'm sure I'll learn more by looking at other cruiser's setups while we're down south. The Annapolis Boat Show was a lot less soggy on Sunday, and a lot more windy too was we got the doublewhammy of a passing cold front and inflow into Matthew, which had turned and was heading offshore. 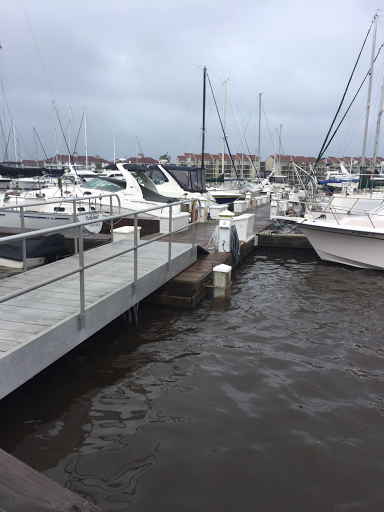 We called Charleston City Boatyard at 10am and got the good news that all the boats were still standing and undamaged...that wasn't the case at some of the marinas downtown. Dawn and I arrived at the show before it officially opened so we went to Pussers for coffee and mapping our strategy. Well, we only had to visit a few electronics vendors before pretty much everyone said go with The GPS Store for the best wholesale prices. So we did. I ended up ordering the Garmin 7607 chartplotter, 18xHD radar, GHP Reactor autopilot corepack, a wind/speed/depth bundle with Gmi20 and Gnx20 indicators plus another spare Gnx20. All this came to a discounted boatshow price of $5800, not bad as retail was over $7k. Then we headed over to Defender and ordered a Vesper XB-8000 AIS transponder + wifi multiplexer at a $140 discount. And I wrapped up my electronics shopping by ordering a new Blue Sea VSM-422 on Amazon.com. Finishing the electronics shopping so early gave us a lot more time to goof around checking out all the boats. Judy Handley alerted me that her good friends Kevin and Claire were at the boat show and would like to meet, so we got in contact and set up the rendezvous. I "knew" Kevin and Claire from Judy's blog - they have a long history with Windbird as they were Judy and Mark's liveaboard neighbors in Boston and were there to cast off the lines when they took off around the world. Later they joined Judy and Mark for a sail around Thailand, and then it was Kevin that helped them do the emergency 5-day delivery from FL to SC in February. They're not much older than Dawn and I, and I thought we hit it off. After checking out the new boats we went over to Brokerage Cove to check out some used ones, and then they went their separate way while Dawn and I resumed shopping, this time for foulies. Judy texted the previous night saying that Mark had received a brand new Henri Lloyd jacket at the Massachusetts General Hospital's America's Cup Experience fundraiser last year, and he'd only worn it once, it was my size, and I could have it - but she didn't know which jacket it was. She sent a pic, though, and the helpful folks at the Henri Lloyd booth immediately identified it as the Ultimate Cruiser Jacket (now called Freedom Jacket). That's perfect as I had been considering buying that jacket. And in fact at the show they were selling Ultimate Cruiser salopettes for a very good closeout price, so Dawn and I both ended up buying a pair. On Monday through Thursday we attended "Cruiser's University," which is four full days of seminars on topics relevant to prospective liveaboard cruisers. My knowledge level in a lot of the areas of my chosen classes was already a lot higher than when we signed up, but most of the classes were still pretty useful, especially for Dawn (we took the same courses maybe 1/4 of the time and otherwise split up). We met a lot of really great people - including a few that'll be doing about the same thing as us, at the same time - and enjoyed the nights out with classmates in Annapolis immensely. It's a great town, and we hope to spend some there with Windbird next summer. Yesterday I dropped Dawn off at DCA after class and she flew home, while I drove overnight to Charleston. I stopped at a truckstop to nap between about 2:30 and 6am, and arrived here at the boatyard just after 8am. I'm happy to report that Windbird did indeed weather the storm very well. The boatyard is almost back to normal and work on Windbird will commence next week. I got some boatwork done today (boom vang bail is fixed! ), will be commuting to Atlanta tomorrow, and then fly my first Atlanta-based trip, a 5-day to Lagos, Nigeria. Finally on Wednesday Oct 19th I will get home to MN for the first time this month. It's been a crazy couple of weeks, I miss my dog a lot, and I really cannot wait for us to all just be living on the boat. We drove 500 mi north from Charleston on Thursday and arrived at the home of good friends in Patuxent River, MD before 9pm. Sylvia Grandstaff and I have been flying-nerd buds for over 15 years; six years ago tomorrow she married an equally big flying nerd, Hugh, who also happens to be a big sailing nerd since he attended the US Merchant Marine Academy and sailed competitively there. The four of us have a ton of the same interests and outlook on life and get along famously, but we don't see each other nearly enough. Sylv is a helicopter pilot in the U.S. Army - I would've voted her "least likely" when we met - and is now attending the extremely selective & rigorous U.S. Naval Test Pilot School at Pax River (yes, they train Army rotary-wing test pilots too). On Saturday Sylv gave us a tour of the Naval Air Station and USNTPS, and I got to see the Blackhawk in which she suffered a catastrophic engine failure last week at the worst possible time (good engine at idle, up against airspeed and rotor speed autorotation limits). If she hadn't done everything right she probably wouldn't be here to tell me about it - but this being Sylv, she did everything right. After the tour we rented a pontoon boat and goofed around on the river until sundown, and then hung out all evening in their 270 square foot tinyhome which they share with two cats, a bird, a ferret, and their cuddly rescue pitbull "Savvy." Yes, Sylv and Hugh are that awesome. We can't wait to have them down to Windbird. Dawn and I drove up to Annapolis today and Sylv & Hugh followed about an hour behind. It rained all day, more heavily in the afternoon, as Matthew's far northern bands crossed the Midatlantic region. Accordingly, I intended to shop for foul-weather gear first-off, but we initially didn't find anything we really liked in our price range at the Helly Hanson or Henri Lloyd tents. I did find a bunch of really excellent vendors to talk to about or get information on electronics, new mainsail quotes, our Awlgrip bootstripe color (Jade Mist Green, I think! ), bottom paints, our worn windlass gypsy, offshore PFDs, LED lighting, etc etc. But it wasn't until Hugh arrived that he steered us towards the Zhik and Musto foul-weather apparel booths. "Oh boy, here it comes," I thought - I knew how expensive Musto is. But amazingly, they had a BR2 Women's Offshore Jacket in Dawn's size on sale for $200, which is a fantastic bargain, so she got that. I tried on an MPX Race Offshore Jacket and thought they had marked it down to $290, but alas, that was the bin number - it was $680 (on sale from $800). Fantastic jacket, I loved it, but not willing to spend that. Hugh ended up getting a Zhik jacket for $330, on sale from $400. I tried one on and it was pretty decent, but it was still a bit above our intended budget and seemed a bit on the light side to me. Well, Gill didn't have any medium OS2s ($199) in stock and I wasn't in love with the Henri Lloyd Freedom jacket on sale for $175, so I didn't get anything and instead got soaked all day in my wool sweater. I was maybe being a bit stubborn because I didn't want the rainy weather to pressure me into making a purchase I'd regret. So tomorrow I'll go back and try on the Henri Lloyd and Zhik again, and maybe hunt a little harder for bargains in the Musto tent. I love Dawn's jacket. It's comfy and built like a tank - it should last her 20 years. Some nice friends of Sylv and Hugh's (Dan and Nancy, I think?) met us at one of the restaurants near the town dock where we had lunch and painkillers before pushing back out into the rain. Eventually the four of them departed to find the Hendricks Gin tent while Dawn and I continued our search. We tried on PFDs several places and ended up buying Spinlock 5Ds, which are considerably more expensive than we were planning on, but with absolute top-of-the-line features and extremely comfortable to boot - and about 25% off retail. We also bought tethers while we were at it. And lastly just before 5pm I decided to get one of the new battery-powered SOS strobes that meet the USCG signaling device requirement. The flares on Windbird are expired (shhh!) so this will make us legal, though I'll keep the flares in the ditch kit too. After we left the show, we met up with the four others at the Fox's Den bar for pizza and beer, then said our goodbyes (Sylv and Hugh won't be coming back up tomorrow) and headed up to our Airbnb condo north of the Naval Academy. It's a really nice place, and we laid low tonight drying out and planning our day for tomorrow. I feel like we didn't get a ton done at the show today, but we did get a pretty good feel for what is where and should be more efficient tomorrow. I finally made a decision on which direction we're going to go with our post-lightning electronics overhaul, and the final result should be pretty awesome. So I have about $8000 worth of electronics to order tomorrow, gulp, and I'm gonna see if I can't get them all for maybe $6800 or so. There are actually a lot fewer suppliers of marine electronics here than I expected, so there's pretty limited opportunity to play them off each other. Mind you, insurance will be covering a portion of it, but probably less than we thought...there's a "new-for-old" adjustment I didn't realize would apply. In other words, we don't have much choice but to buy a new autopilot brain, but they'll only give us the depreciated value of our 10-year-old one. So we're still value shopping, even for stuff the lightning took out. Awright, so talk about burying the lede...no, we do not yet have any news of how Windbird fared during Hurricane Matthew. South Carolina seems to have been hit a lot harder than Florida and Georgia, as Matthew finally came onshore in the Charleston area. The winds weren't terribly high (60 kts was the highest I saw reported at Charleston Airport) but the storm surge was pretty big and came right at high tide. 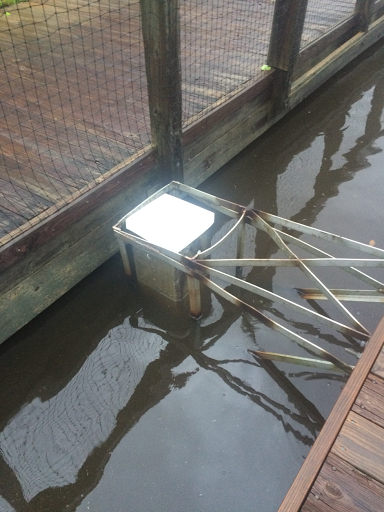 Up in Myrtle Beach, John Schwab reported that Lightkeeper's Marina came close to losing their docks as the water lifted them to the very top of the pilings (and this at a place 6nm from the nearest inlet, where they only had 3' of storm surge during Hugo). See pics below. So that has me a little worried...Windbird is 14nm from Charleston Harbor but the Wando River is entirely tidal. I called Charleston City Boatyard tonight and the call was routed to the manager's phone number; he said he had evacuated with his family and hadn't heard any news from the yard yet (that's good, right?) but should know in the morning. So I'll call then & try to resist doing it obnoxiously early. Boats, like airplanes, seem to take on lives of their own, with unique histories and distinct personalities, at least in the minds of their owners. Boat ownership, for most, has a certain emotional component, with the accompanying highs and lows, bouts of love and hate, joy and sorrow. But you try to keep emotion out of it when you buy a boat (or, for that matter, when you sell it). You make lists of boats, crunch figures, ascribe pros and cons, enlist the help of impartial brokers and surveyors. But the reality is that very few will pull the trigger on such a big purchase unless they like the boat, if not love it. Windbird wasn't the cheapest boat we looked at (most certainly not after refit) nor the best equipped, or even the most ideal for the type of cruising we'll be doing - but we liked her. And worse (from an "impartial buyer" standpoint), we really liked her owners. I'll be honest, Windbird wasn't love at first sight. My first thought when I saw her was that she looked used. The broker had been frank in my initial discussions with him and so this didn't come as a surprise, and I tried to look past it knowing that cosmetics are a rather small component of selecting a boat - but I came away from that initial look without a great deal of enthusiasm. And then I started reading Judy Handley's blog, and the more I read the more I was impressed with what they did with Windbird, and I started to see the real value of many of her features. When I went back to see the boat with Dawn, it was after having read about half of Judy's circumnavigation logs, and I seemed to see Windbird with different eyes. I was aware that reading the logs were giving me an emotional attachment to the boat - and to Mark & Judy - but I kept reading anyway and pretended that emotion didn't influence the final decision. It undoubtedly did. Now I look at Windbird, and while I still see the "used" bits (really, the bits that are awaiting our attention), she looks beautiful to me. I imagine her rocking at anchor in exotic landfalls during her circumnavigation, and surfing down greybeards in the December Atlantic with Mark at the helm. I dream of our future life aboard her. Every time I walk away, I turn around to admire her. My "like" is turning into "love." As Dawn and I formed this connection with Windbird, we've also formed a connection with Mark and Judy that I think is stronger than most owner-buyer relationships. During the negotiation & sales process they struck me as very fair and reasonable people, and I tried to act in kind. I read the rest of Judy's logs and we started corresponding regularly via email, while Mark and I mostly talked on the phone. I often read new emails and logs to Dawn. Mark and Judy showered us with books, tools, equipment, and advice. We were really looking forward to meeting them and having them down to the boat - the request was actually included with the purchase agreement - but the sale dragged on and we waited longer than we should've to put it together, and then Mark's health took such a downturn that we scuttled the boat plans and decided to travel to Cape Cod instead - but alas, we were too late. Mark's death hit Dawn and I a lot harder than you'd expect considering that we'd never met the man in person. Nevertheless I felt a real connection there, and knowing he was gone left a really hollow feeling inside - almost like an early preview of losing a parent. Dawn and I were really honored when Judy invited us to attend the Celebration of Life hosted by New Hampshire Public Radio in Concord, NH, and even moreso when she asked me to read one of Mark's favorite passages at the event. The timing worked out really well and we flew up from Charleston to Manchester via LGA yesterday morning. We checked in at the Concord Days Inn, which is where Judy met us yesterday afternoon (with another two tubs of tools, books and equipment to bring back!). It was oddly like running into an old friend. She has a personality that immediately sets you at ease - something I later also noticed about her daughter and son-in-law, and several old friends we got to know over dinner. I love that. The Celebration of Life took place at the Capitol Center for the Arts in downtown Concord and featured a number of speakers who had worked with Mark during his years at NHPR and NPR, both in management and on-air roles (Mark was President & CEO of NHPR for 15 years and also Chairman of the NPR Board of Directors for several years). Most had been sailing with Mark on Windbird or other boats, as he clearly loved sharing his passion for sailing with others and treated his work colleagues like family. As they spoke, I realized that I couldn't really go up there and read the piece without somehow explaining my connection to Mark as something other than just the guy who bought his boat. So I scribbled out a few sentences about how I'd come to know and admire Mark in the last months of his life and how I continue to discover more about him as I become more intimately familiar with his boat, the physical embodiment of an ambitious lifelong dream that he and Judy actually made come true. Shortly after I was done writing, Heather (Mark & Judy's daughter) gave a really wonderful, remarkably composed eulogy, and then it was my turn. My speech wasn't polished and the delivery wasn't practiced so I basically read it, but I think the audience understood what I was driving at. And then I read this selection, which was James Kavanaugh's introduction to his 1970 book of poetry "There Are Men Too Gentle to Live Among Wolves." Afterward Dawn and I hung around a while talking to Jed and Heather and various friends - including quite a few names that rang a bell from Judy's blog - and then her friends David and Susan invited us to dinner with them, Judy, and three others at a nice bar and grill a mile or so away. It was a quite enjoyable time with some very smart, friendly people. Our discussion veered strongly into politics for most of the time - which these days is mostly a really cringe-worthy topic for me - but this stayed quite civil if for no other reason than that all of us (Republicans / newly-ex-Republicans included) were sane enough to recognize that Donald Trump is a stark raving lunatic. But we didn't get to talk to Judy a ton, other than an entertaining discourse on how to best lug a full supply of beer around the world! The evening wrapped up fairly early and we retired to the Days Inn. We went to breakfast with Judy this morning and had more time for discussion, mostly boat-and-weather-centric (yes, Matthew is still bearing down on us) plus a little more politics. We made plans to have Judy down to the boat once Windbird is back in the water, exchanged hugs, and took a group picture (send a copy, Judy!). It was really special meeting Judy and spending time with her and her family and friends, and Dawn and I were both very happy that we were able to come up to NH for the Celebration. Our flights back down to Charleston went fairly smoothish (ok, if you don't count the stop in Raleigh-Durham for a medical emergency), but on the drive back to the boatyard we were surprised to see the streets are already almost completely abandoned. A lot of people have already evacuated, and every inland hotel in the state is reportedly full. We'll do a little more storm prep tomorrow, and then head out of town to visit friends up in Maryland, do the Annapolis Sailboat Show, and attend "Cruiser's University" next week. The big news around here is Hurricane Matthew; though it's presently only at the southwestern corner of Hispanola there's an excellent likelihood that Charleston is going to be affected this weekend, and an increasing chance that we take a Category 3 walloping. 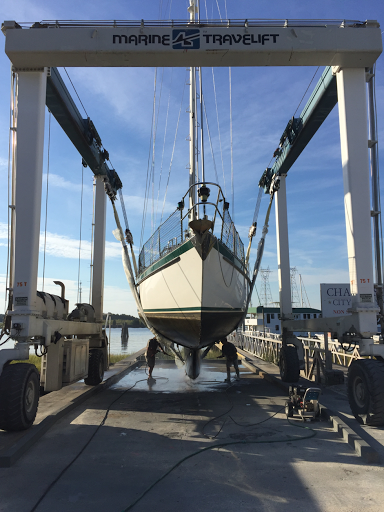 Accordingly Charleston City Boatyard is in full storm prep mode, with the Travellift staying busy hauling boats from early in the morning until late at night. Yesterday Windbird was the first boat out of the water notwithstanding the substantial current that seemed to have us pinned in our berth. There was actually enough room to spin Windbird around on her bow and steam out of our alley against the current. My side-current docking at the slipway wasn't terribly pretty but there were plenty of line-handlers to catch us. The rest of the haulout, pressure-washing and jack-standing process went very smoothly. We elected to pay extra to have several anchors driven and Windbird strapped down to them, given the escalating risk from Matthew. Of course the adjacent boats aren't strapped down and if they topple our caution is all for naught. The boat just to our south also has a bunch of loose junk on deck. I may go lash it down on Thursday if it looks like we're going to take a good hit. The rest of our day was largely taken up with storm prep plus a few other boat projects to finish preparing for the refit. 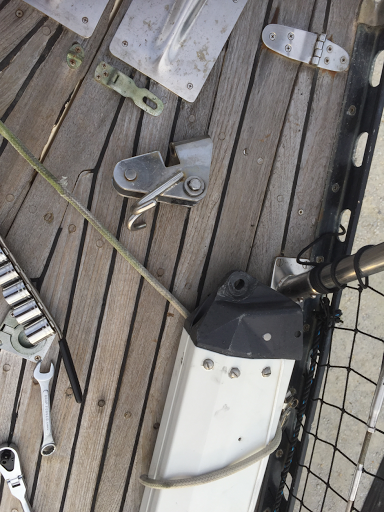 We took off both the boom and spinnaker pole and lashed them to the toerails along the foredeck; I removed the broken gooseneck fitting and collected the new one that RigRite had shipped to CCBY for us. We took the dinghy down from its davits, wrestled it around to the side of the boat, laboriously cranked it up using the spinnaker halyard, and lashed it between the mast and staysail. That would have been so much easier when we were in the water with the dinghy-hoist system still rigged! Oh well. We are planning to come back before the storm but just in case we don't make it back for some reason we decided to completely storm-prep by removing all the lines, fenders and gear from the rear arch, lashing the Bimini & dodger framework in place, and taking the blades off the wind generator. We also rearranged the v-berth to facilitate post-refit re-rigging, removed the remaining internal chainplate covers, ordered our new mast track from Tides Marine, and I installed a stainless folding step for the v-berth. We took an hour long nap during the hot afternoon, and still got done in time to enjoy sundowners in the suddenly-bare cockpit while listening to Jimmy Buffett. Then we headed to a nearby sports bar to watch our Minnesota Vikings beat the NY Giants on Monday Night Football. 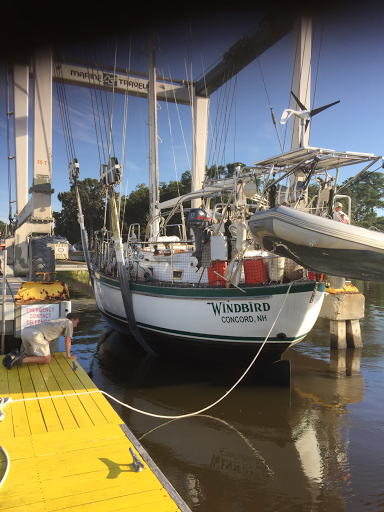 We've had a productive three days here at the Charleston City Boatyard, and Windbird is ready to haul tomorrow morning at high tide (10:58am). I'm a little nervous about getting her out of our current docking spot...we've got a 107-foot motor yacht named Shana parked behind us and the only way to get out of here is to reverse, which is a maneuver in which Windbird doesn't excel. I'm thinking wait for absolute slack water and then kick the stern out about 40 degrees with a bow spring line and a big fender in forward gear (left hand prop, remember) then use reverse propwalk to straighten out as I sneak around that very expensive yacht's 26' beam. We'll see how that goes. In the last few days we've stripped Windbird of her sails, her stack pack, lazy jacks, all her lines and halyards, her dodger, bimini and enclosure, her dinghy hoist, her chainplate covers, her mast-bottom electrical connections...all that's left to take off - after she's hauled - is the spinnaker pole and boom. We've also done a fair amount of cleaning, which is probably pointless as she'll get filthy again in the yard. I replaced her lightning-fried stereo yesterday and we were happy to have tunes again. 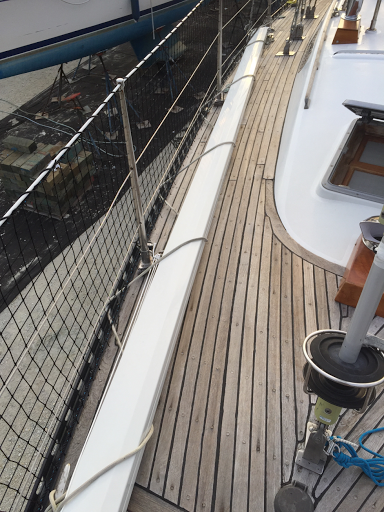 I have a replacement part for her gooseneck to install on the boom tomorrow and will try to get the current one welded as a spare, and will be ordering new Tides Track tomorrow as well...I went up the mast to measure it today. I definitively diagnosed the fuel problem (he said oh-so-cautiously) but none of the few marine stores open on the weekend had the necessary parts so it's a fix I'll be making on the hard and testing once she's splashed again. Thank you Al for the suggestions in the comments to my last post, thankfully it didn't get that involved. There were two blockages that I identified - which screwed with my initial diagnosis - but with both of them bypassed the engine is getting plenty of fuel and is running well. Our days have been productive but we've found time to have some fun at night as well. Friday night we went out in Charleston, and last night we saw the movie "Sully" at a local ciniplex. It was pretty good considering that I'm pretty intimately familiar with the subject material. Their depiction of the NTSB investigation was pretty bogus but there was a lot else they got right, including quite a few things that nobody but an airline pilot would notice. I'm actually friends with Jeff Skiles, the FO on USAirways 1549, and Aaron Eckhart did a rather good job of adapting his personality and sense of humor. As an aside, I was in lower Manhattan when they ditched in the Hudson. I had landed at Newark earlier in the day and, as was my custom, took my crew across to NYC to do the tourist-and-pub-crawl thing. We were waiting in line for the Staten Island Ferry (free, and affords a nice view of the Statue of Liberty) when a bunch of news helicopters started orbiting over the harbor and several police boats tore out of the East River and up the Hudson. We got on the ferry and soon overheard someone saying that a USAirways Airbus had crashed. I felt absolutely sick. Then we all started reloading cnn.com on our phones and soon discovered everyone had survived and was floating serenely down the river towards us. What a great feeling, then and in the days afterward. I will note that day was wicked cold, and cloudier and breezier than depicted in the movie. We stood on the back deck of the ferry trying to see the commotion upriver and were soon chased inside by the icy wind. Dawn and I met a nice older gentleman on the docks today named David; he has a gorgeous 1999 Tayana 65 named Pintail that he's been working on here for "1 year 7 months." He said this boatyard has been extremely slow for him. I certainly hope that's not the case for us, all the google and activecaptain reviews I read online were fairly complimentary. We'd really like to be done in a month so we and Piper can move aboard. Tonight we found a local sports bar called Tailgators & we'll be returning there tomorrow to watch our Vikings take on the Giants during Monday Night Football. Very early Tuesday we'll be flying out to LaGuardia and then Manchester, NH to attend Mark Handley's Celebration of Life in Concord, NH.